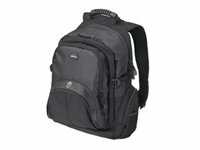 This Backpac appeals to today's mobile professionals with an active lifestyle and a more casual work environment. Combining convenience and comfort with attractive design, it offers efficient storage for your notebook computer and mobile accessories. The removable notebook compartment (holding screens up to 15.4") is fully cushioned and has a security fastener ensuring your notebook stays firmly in place. Functional solution at the best price.